The SaveNow School2Home Energy Efficiency Kit is packed with products to help you save energy and money. Inside the kit is a Quick Start Guide that offers tips for even more savings. If you need help installing the items in your kit, simply click below to view installation instructions. Make the ‘bright’ choice. 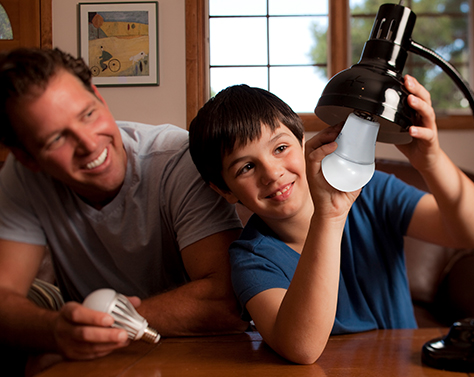 Replace incandescent bulbs with 9-watt Omni-Directional LED light bulbs. 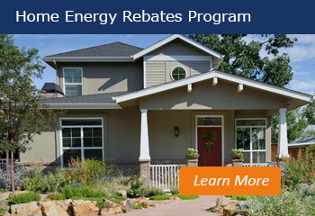 This ENERGY STAR®-rated upgrade saves 80% more energy and lasts up to 40,000 hours. Shower yourself with energy savings. Toss out that old, water-wasting showerhead and turn your shower into a money-saving opportunity! The High-Efficiency Showerhead adds pressure and oxygen, so you use less water and less energy to heat the water. The average family can save up to 3,000 gallons of heated water a year. Go with the flow and flip on the savings. The Kitchen Faucet Aerator is a must-have in any kitchen. Choose a spray or stream and adjust the water flow with the flip control. Every kitchen needs one! This high-efficiency Kitchen Faucet Aerator saves water, energy, and money. Rinse away your high water and energy costs. The Bathroom Aerator provides full, strong water pressure while using a fraction of the water. Save as much as seven gallons of water a day, and pocket the savings. Test the temp and take control of your savings. The Digital Thermometer is a complete multi-function tool. Use it to check for leaky windows and doors, check the temperature of your refrigerator and freezer, or check the setting on your water heater.